John Diemer and Lauren Toyota of the hot for food blog. I had the wonderful opportunity of interviewing Lauren Toyota of the hot for food blog which she manages with her partner John Diemer of The Farmhouse Creative Labs. Lauren Toyota has made a name for herself as one of Canada's most recognizable voices in media broadcasting. She has worked in various capacities as television host, VJ and producer, and is well known for her roles on Much Music and MTV. This month Lauren will appearing as the Juno TV host for the 2015 Juno Awards. The hot for food blog has a strong following and has become an outlet for Lauren and John to spread their message about veganism by breaking all misconceptions of what veganism is and to open people's eyes to "the healthy, flavourful, and satisfying world of a plant-based diet." The duo posts delicious recipes on their blog and speak out about issues that they are passionate about. This week they are participating in the largest campaign in the world to end animal testing for cosmetics through #blogforbunnies with humane society international. They have also appeared on numerous talk shows and have been featured in Laika Magazine, become regular contributors to Clean Eating Magazine (circulated to 1.2 million annually), and have had original hot for food recipes shared by Food Network Canada, Women's Health Magazine, V-lish.com, and Raw Food Magazine. 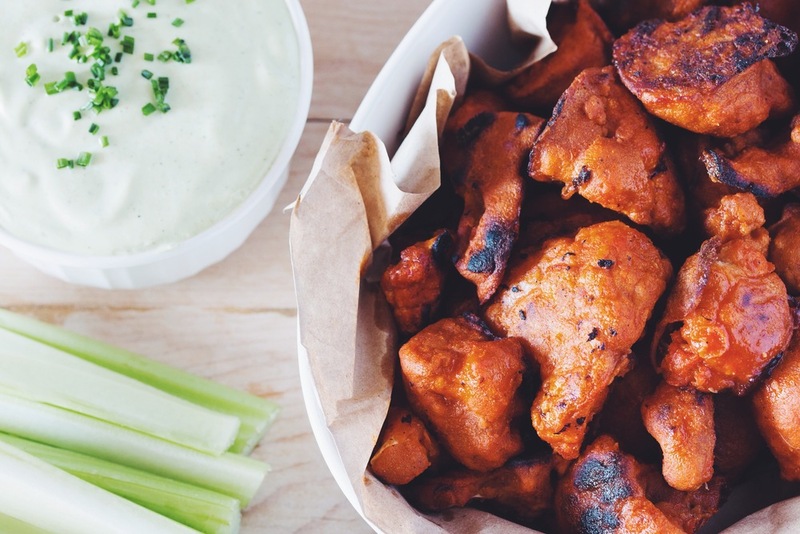 Lauren has kindly shared her Cauliflower Buffalo Wings & Vegan Ranch Dip recipe which I made last week and I have been raving about them ever since! You'll find the recipe below the interview content. I used rice flour to make my batch gluten-free and I also opted for an organic bbq sauce instead of the hot sauce (the kid-friendly version) and they were fantastic! I understand that you became a vegan in 2009 after being a vegetarian for many years. How did you first come to veganism? For years I said I could never give up cheese. However, I’ve always been lactose intolerant and just kind of lived with it, thinking "isn’t that what everyone is doing?” and "I’m supposed to feel sick". It’s actually insane when I think about it. I also watched Food Inc. and then read Michael Pollan’s “The Omnivore’s Dilemma” and that’s what sparked the exploration of becoming vegan even further. I started slowly and eliminated one food at a time, doing cheese last. Funny enough, cheese was the easiest thing to give up and after 3 weeks I didn’t even crave it anymore. I just never gave myself that opportunity. What was it like going vegan? What has changed in your life from your decision to go vegan? Going vegan was the best thing I’ve ever done for myself. It not only clears your physical body of toxins and negative energy, but it deeply affects your mind and soul and does the same kind of clearing automatically. You just kind of wake up and turn on after eliminating animal products from your diet. I’ve become a more aware person, a more conscious person, and a more alive person since going vegan. How did the hot for food blog evolve? Was this something that you always wanted to pursue? I started blogging just before I became vegan in January 2010. The early posts were about my experimentation with food and what was working and what wasn’t. Those posts have since been deleted as the blog is now 100% vegan, but I used it as a way to stay motivated to make these changes and as a way to connect with the food community. I have always dreamt of cooking for a living or having a cooking show, but not specifically blogging. And I certainly never thought I would learn how to take good photographs with a real camera! That was just something that happened. I read that your blog didn't become serious until you met John. In what ways have both of you as a couple and your blog evolved through your mutual passion surrounding vegan food? Meeting John was exciting in many ways, but really exciting because he was just as passionate about food as I was. However, we came from different backgrounds and he didn’t know much about the vegan lifestyle or vegan cooking so I got to teach someone. He was instantly into the idea of being vegan and very quickly adopted that way of eating. He also challenged my cooking and my imagination because he wanted to eat certain meals and together we figured out how to make them vegan. That’s how hot for food blog became what you see now. February 2014 is when hot for food blog took on a new look and feel and that was really because of John. I wanted him to part of the creation and part of the brand. I officially count February 2014 as the real start date of hot for food blog. Food should make you feel good and if it doesn’t then you need to listen to your body and make changes. The food we eat should also be as whole as possible most of the time. I think if the food you eat comes from a good and positive place energetically than you will feel that way too. That’s why eating something that was once living and has been treated and killed in a cruel way doesn’t sit right with me or in my body. What is the biggest misconception surrounding the vegan lifestyle? That vegans are scary, judgemental people and that vegan food must be lacking in something like flavour, protein etc. What advice would you give to someone who wants to make the switch to a plant-based diet and lifestyle? My advice is to start small. Like trying to accomplish any goal you can’t take on everything at once or you’ll be overwhelmed and likely not follow through. So start with Meatless Monday meals, then work your way up to eating a few vegan meals a week. Don’t throw out everything in your fridge and replace those items, just work toward that as you use things up. I didn’t even worry about clothing, beauty, and home products at the beginning of my journey because it was overwhelming to commit to the vegan lifestyle in one fell swoop. But over time, and only recently, have I started to make those changes to all aspects of my life. With the Junos just around the corner, how do you stay healthy with such long work hours? What are your go-to meals when your schedule is really busy? Smoothies are great on the go and you can pack a lot of nutrition in them. I’ll be in Hamilton for the Juno’s and I’ll be visiting The Green Smoothie Bar a bunch. But I always research where I’m going and what restaurants are available to me. If there’s limited selection then I try to pack foods for my trip that I can keep in the hotel and carry with me. What are your favourite Toronto Vegan food spots? What are your favourite recipes from your blog? 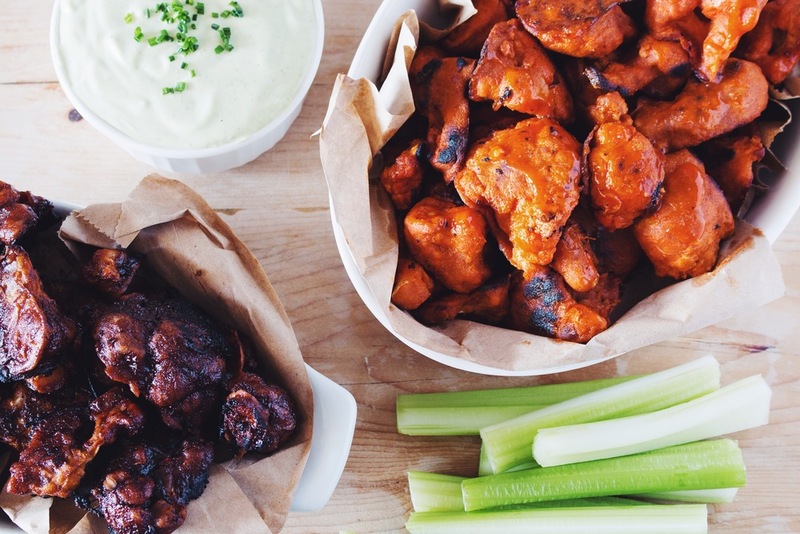 I like the perfect vegan mac & cheese, cauliflower buffalo wings, and coconut fakin’ bacon because those are always the things I feed non-vegans and they’re always in love! What would be your ultimate natural beauty tip? I’ve never identified with that word and was actually very reluctant to venture into that part of the vegan lifestyle. Just because you’re vegan doesn’t mean you have to go to a fur demonstration touting signs and shouting. But if you do that and it calls to you, that’s great! You should do more of it. I decided about a year ago to put myself in these situations and experience a protest, which I never had before. It was a valuable experience but didn’t totally feel right for me. I’ve been involved in a few things within the community since then, like Toronto Pig Save and The Walk For Farm Animals. I’ll continue to do some form of community engagement from time to time, but through that exploration I realized I am an activist and my medium just happens to be food. Everyday I put the message out there for a more compassionate and ethical world and I want to reach more people with that message. I want the whole world to be vegan, and I think starting with our relationship with food is the best way to get there. That’s the whole point of hot for food blog. That’s why I go on television and talk about why I’m vegan and how one can incorporate more plant foods in to their diet. That’s why I want my work to be in other publications so it sees more eyes. So what I do is activism in my own unique, personal way and in a way that I’m comfortable with. 1. Line baking sheet(s) with parchment paper and preheat your oven to 450F. 2. Wash and cut cauliflower head into bite sized pieces/florets. 3. Mix all the ingredients, except the earth balance and hot sauce, into a mixing bowl. NOTE: The batter shouldn’t be so thick that it doesn’t drip but not so runny that it doesn't stick and coat the cauliflower. If using rice flour you may need to add a little more liquid to get the batter the right consistency. 4. Dip each floret into the mixture and coat evenly. You can shake or tap off the excess on the side of the bowl. 5. Lay florets out evenly without over crowding onto parchment lined baking sheets. 6. Bake for 25 minutes until golden brown, flipping the florets over half way through. 7. Meanwhile, in a small saucepan on low heat melt the earth balance buttery spread and whisk in hot sauce, bringing to a low simmer. Then remove from the heat and set aside. 8. Remove the cauliflower from the oven and put all the baked florets into a mixing bowl with the wing sauce and toss to coat evenly. Then spread all the florets in wing sauce out onto the same baking sheet. 9. Bake in the oven for another 25 minutes, flipping the florets over half way through. 1. Finely chop the fresh dill, parsley and chives. 2. Whisk together all the ingredients until smooth. 4. Refrigerate the ranch dip for at least 30 minutes before serving. sauce or just do all bbq sauce for a kid friendly version. Special thanks to Lauren Toyota for her time and for sharing her recipe!